Handel, a former Georgia Secretary of State, is currently running neck-and-neck with Democrat Jon Ossoff in the race to replace Dr. Tom Price, who was appointed by President Donald Trump as Secretary of Health and Human Services earlier this year. Ossoff is a newcomer to politics who actually lives outside the district, but who has energized Democratic activists and donors nationwide in the primary race in April by shaping his campaign as a referendum on the Trump administration. Republicans in the district told Breitbart News during a visit Sunday that they were cautiously optimistic, despite poll numbers showing a dead heat or Ossoff with a small but significant lead. 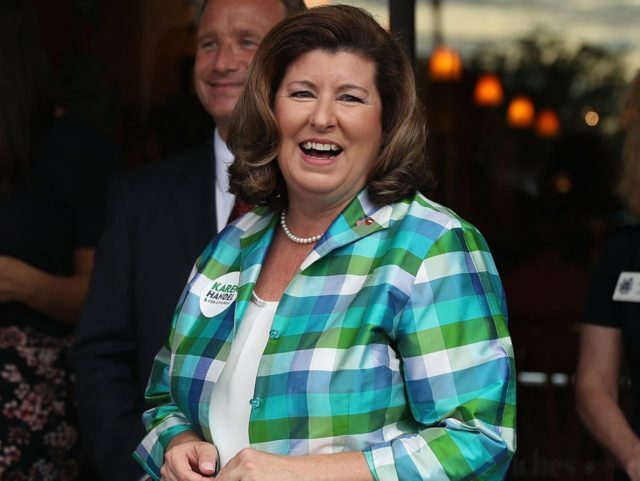 Handel shared their optimism: “I feel great about things — early voting numbers that we’ve seen look very positive for me, and Republicans tend to be strong on Election Day,” she said. Politico reported on Sunday night that Republicans believe massive early voting numbers — over 140,000 — favor them, and that they hope to capitalize on the fact that there are more Republican voters in the district. The race has involved some $50 million in spending on both sides, making it the most expensive race in congressional history. One of the major national issues — aside from Trump himself — is health care, with Republicans’ ongoing efforts to repeal Obamacare criticized by both liberals (for tampering with an entitlement) and conservatives (for not going far enough). But Handel says that has not been a big factor in the race. Election Day is tomorrow, June 20, and both parties seem to expect a close result.